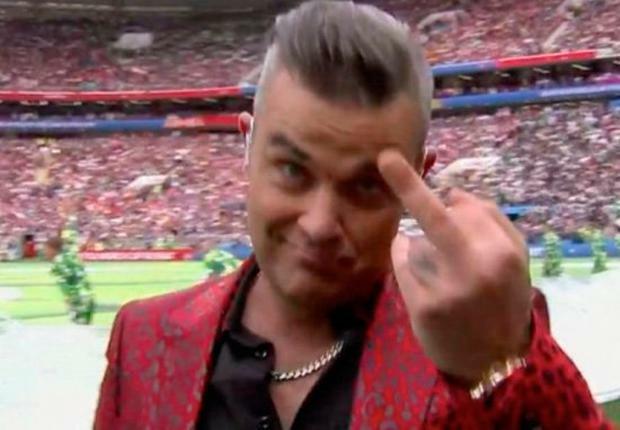 Robbie Williams kicked off the World Cup in Russia last night by performing some of his classic hits at the opening ceremony - and putting his middle finger up at the camera. The British singer remained true to his word and avoided singing his 2016 song Party Like A Russian, which attracted negative press in the country as the song appears to criticise the excesses of Russian oligarchs. Robbie appears to make a rude gesture. But he still managed to court controversy when he made a rude gesture at the camera while singing his song Rock DJ. The former Take That star opened the set by strutting on to the football pitch to the sound of his 1998 single Let Me Entertain You, wearing a red leopard print suit and black shirt. As he started singing, he was joined on the pitch by dancers clad in football-related costumes, including some with large football-shaped hats and others who were performing tricks with balls. Russian operatic soprano Aida Garifullina then made her way on to the playing field, riding on what appeared to be a large phoenix. Williams then sang his other single Feel while the word 'Love' was spelled out by dancers on the pitch. 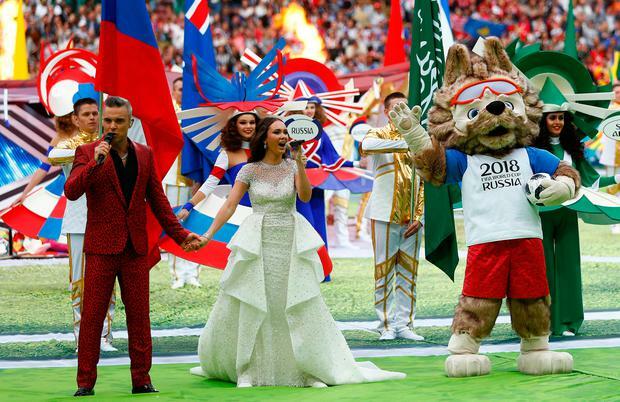 Williams and Garifullina then joined forces for a duet of his single 'Angels' as the crowd at Moscow's Luzhniki Stadium sang along. However, fans watching on TV were not able to watch his next performance of Rock DJ, as coverage cut back to the studio. Videos and pictures started to circulate on social media of Williams with his middle finger up at the camera shortly afterwards. Before taking to the pitch for the opening ceremony, which the singer described as a "pinch me moment", Williams admitted that he was not feeling too hopeful about England's efforts in the tournament. Speaking ahead of his performance, he told ITV, when asked how he thinks England will do: "It's been disappointing, a lot, being an English supporter."